Orange, vermilion, scarlet, burgundy, and yellow – they’re the colors we usually associate with the fall garden palette. We rarely think about pink. 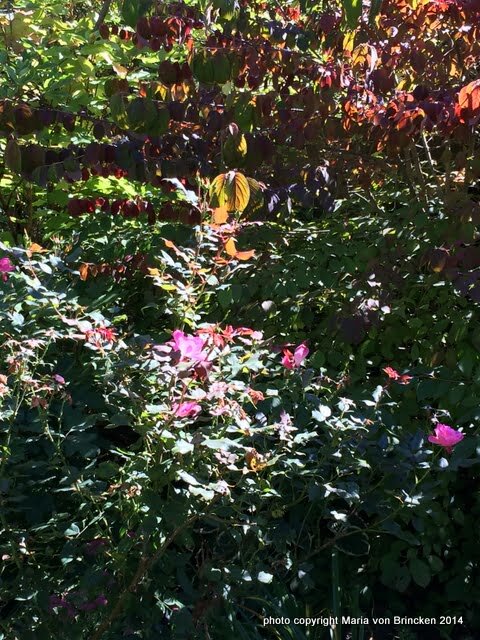 As I walked within my garden this morning less than twelve hours from the Fall Equinox, I realized the predominant flower color is pink. And I love it! Better yet, these flowering plants may well continue into late October. Consider this fall palette – the planting combination using Sedum ‘Autumn Joy’ with Miscanthus sinensis ‘Variegatus’. 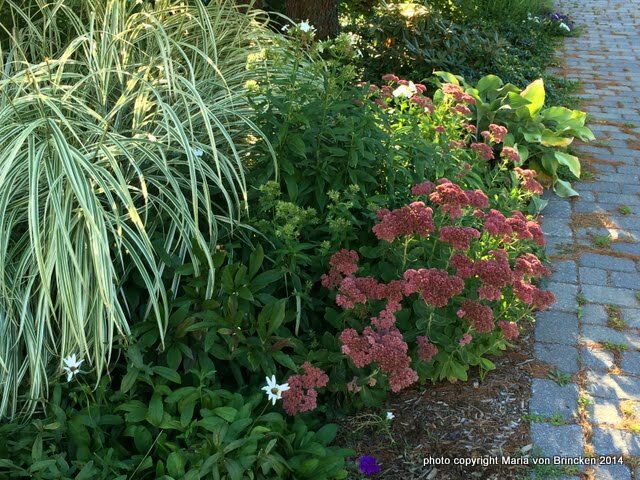 The sedum of late August was a slightly paler pink than you see in the photo above. It deepens responding to the cooler nights and perhaps shorter days. When our first frost arrives, this variety will signal that event by turning carmine. A quick look out my door or window tells me what happened the night before. Closer to my front door I see the long-blooming, light pink rose, ‘The Fairy’. It’s been blooming on and off since late May. It’s paired with the pink abundance of Lantana and white Scaevola in the container. I’m reluctant to take them out to plant fall annuals. 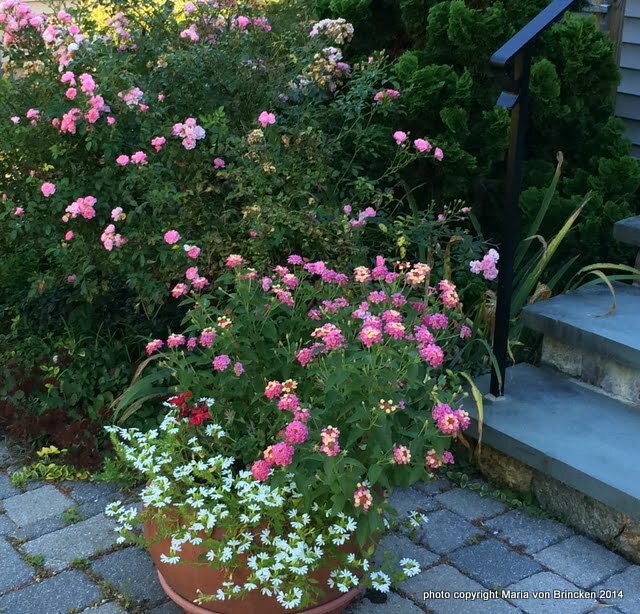 By the way, earlier in the summer, white petunias and a deep pink geranium graced the container, but somewhere in mid August gave up the ghost. I’ll probably do what I always do – gather the ‘mums on the steps – maybe in the colors of rust, burgundy, and white, with an orange pumpkin. 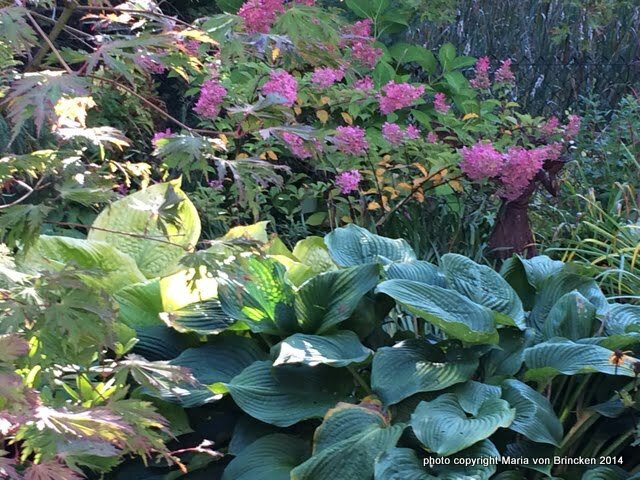 In the back, the ‘Quick Fire’ Hydrangea started wearing its fall colors early in September. The flowers started turning from white to a pale pink here and there. But the pink has been getting intenser every day. And now the deep pink pairs beautifully with the foliage of the large blue leafed Hosta ‘Blue Angel’ with a bit of the turning foliage of the Acer ‘Filicifolium’ showing in the left corner. Gracing the opposite corner of the back garden blooms the ‘Knock Out’ Rose. It’s long blooming abundance pairs well with the fall seasonal burgundy foliage of Viburnum ‘Mariesii’. It’s a favorite combination of mine. While orange may be the new black, pink might be the new orange as a lovely option for the fall color garden.